Sailing, usually a fun and rewarding sport, can also be dangerous. 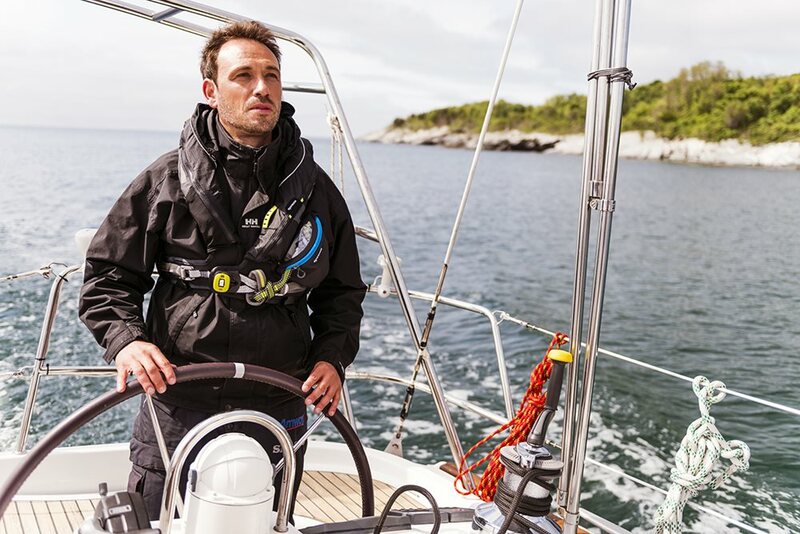 Quantum sail consultant and Farr 40 pro David Gerber talks about the importance of safety on the water and simple things you can do to make sure you and your crew are safe. Any time we’re on the water we all have to be aware of safety best practices. For racing, specific class rules or regatta rules generally require some type of safety equipment. This is fantastic and is helping to keep racers safe. But what about the other aspects of our sport? Here are some tips and reminders for year-round sailing safety for both racers and cruisers. There are many great sailing safety classes available through well-respected vendors, like the Safety At Sea seminars done by Storm Trysail Club Foundation. These classes offer opportunities to practice all parts of sailing and sailboat safety. Some classes are often required to participate in offshore races, but are also available and can be invaluable to anyone planning on cruising offshore. For example, many offshore races, including the Newport to Bermuda Race and Transpacific Race, require a certain number of the crew to have participated in the Safety at Sea seminar. The seminar is designed for sailors of different skill levels and discusses safety aspects of both inshore and offshore sailing. Sometimes, our schedules don’t allow us the time to participate in a class. Sometimes, we just want to go for a sail. Knowing this, how do we deal with our personal safety or that of our passengers? To assist me with this topic I sought the expert advice of two certified captains, David Conrad and Jake Anderson. For starters, hold a brief and confident safety briefing. Make sure you and your passengers know the location of life jackets, first aid kit, fire extinguishers, ship to shore radio, life ring and bilge pumps. Make sure all know how to use these basic safety items. If needed or required you may have to discuss USCG flares and how they are used. Always explain the importance of staying calm in the case of an emergency and creating an action plan to get out of the issue safely. Briefings take time, but if it brings ease of mind we all have more fun. Briefings are great, but it also doesn't hurt to practice emergency protocols. Spend a warm summer day practicing man-over-board drills and make sure more than one person knows how to handle the boat in case you are the one that falls over! I can remember plenty of times where a warm and entertaining person in the water drill brought smiles to whole sailing crews. Also, much like you make sure your kids know how to dial 9-1-1, make sure everyone knows the proper procedure for calling for help. You as the skipper might know what to do, but what if you're the one needing help? All of this might make you feel a bit like a flight attendant, but my point is, don’t worry about the redundancy. Make the team feel safe, and they will act safe and enjoy the sailing experience. Many years ago, I was sailing an event in Newport, RI. This particular day the weather conditions were surly and we were involved in a serious starboard/port incident. Our accident was severe and we were taking on water. Fortunately, not only did our particular racing class have safety rules, we had regular safety briefings and we were all up to speed on our safety protocols and were equipped to deal with this situation. This foundation and preparedness allowed us to have a very brief discussion and quickly form an action plan. We didn’t have any injuries, we didn’t hurt anyone else and we didn't lose the boat. Perhaps our confidence as a team helped, maybe we were lucky, who knows. But, I do know that we took the time to talk about safety beforehand and when disaster struck, knowledge allowed us to remain calm and make a plan that helped us to safely make it ashore. Some specific classes and/or regatta rules require specific safety equipment, make sure you have these items, along with the other safety staple items you should always have aboard. Keep an inventory of safety items on the boat and where each is located. Some safety gear, like many other things, does have a shelf life and can wear out over time. Keep track of flares, fire extinguishers, inflatable life jackets and rafts as these need to be serviced or replaced after time. Make sure first-aid kits are replenished after use and take the time to have a quality control check of regularly used safety items. It's amazing how fast the Band-Aids run out! Repair or dispose of any outdated safety gear appropriately and make sure it's replaced. While you should set aside some time throughout the season to do an inventory and quality check, you should make sure to do this before any offshore adventure or race. A comfortable crew and/or team will offer the opportunity for stupendous sailing adventures. Make sailing safe, make it comfortable, make it fun and they will come back. You can also find other great resources and stay up to date with the latest in safety on the US Coast Guard's boating safety site and on Cruising World's safety site.